The summer fellows program at Catholic Community Connection gives local college students the chance to immerse themselves in a 10-week internship for one of several Cleveland-area Catholic-based organizations. 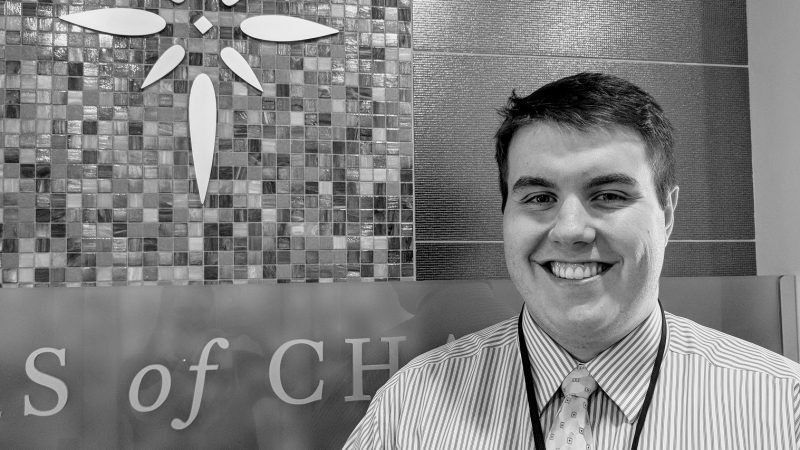 This year, Tom McCartney, recent graduate of John Carroll University, stepped in to get his feet wet in public policy and advocacy with the Sisters of Charity Foundation of Cleveland (SOCF), as well as the Sisters of Charity Health System (SCHS). A funder of Catholic Community Connection’s first summer fellowship, the SOCF wants to focus more closely on public policy as part of its efforts to break the cycle of poverty. That’s where McCartney, who holds a B.A. in political science, says he fit right in. His work for the foundation has involved researching other foundations with public policy programs to learn more about how they are structured, and what systems are in place to support them. He said it has been especially interesting to understand how policy affects the many program areas of the foundation. Adrienne Mundorf, senior program director at SOCF, has collaborated with McCartney on his work. McCartney has also spent much of his time this summer supporting SCHS and its Building Healthy Communities program. He’s done extensive research through legal documents and policy to help the BHC program in its efforts to motivate residents to work together with local organizations for positive change, good health and growth in their own lives, their neighborhoods, and the community. For the health system, he has been involved in discussions around health policy issues, and he said he finds advocacy work especially rewarding. When McCartney’s 10 weeks are finished, he’ll plan on diving into the job market, he said. Finding a position in a nonprofit or doing advocacy work would be ideal, especially following the experience he has had with SCHS and SOCF. McCartney said that a lot of that positive energy comes from the Catholic sisters he’s met. As part of the fellowship, Tom spends “Fellowship Fridays” with fellows from different organizations, sharing informative learning sessions and reflecting on their experience. McCartney said he’s been impressed with the work of SCHS and SOCF.